The weather here has been so up and down that it's hard to believe it's already spring. Spring is traditionally the season of florals and pastels, so today I'm going to show you a selection of pinks and neutrals from the Sally Hansen Complete Salon Manicure line. To give you a little bit of background information, this collection is described by Sally Hansen as a seven-in-one formula containing all seven steps of a manicure in one bottle: base coat, strengthener, growth treatment, color, top coat, gel shine and chip resistance. This is an enhanced formula, which previously contained the first five steps. Despite the fact that this polish has a base coat built in, I never paint my nails without using a separate base coat to protect them. I did photograph them below without top coat so you can see the natural application. The best thing about these polishes, aside from the huge range of colors, is that they feature Sally Hansen's Precision Brush. This is a shorter, flatter brush than typically found in other lacquers, and according to Sally Hansen it contains an 800-bristle count. It's the perfect shape to apply even layers of polish close to your cuticles without flooding them. One thing to note, however, is that in a few of these bottles some of the bristles had formed jagged edges and made the application a little difficult and streaky. This happens a lot with some of my older polishes, so it's just something to look out for while picking out your polishes from the store. Rosy Outlook is a vibrant rose pink. It's a great pop of color in this season of blushes and soft hues and I think this would be ideal for floral print nail art. Pictured above is two coats; the application was easy and I got full opacity with just two coats. It dried well without any streaks, so I think this is a good "grab and go" polish if you're in a hurry and need to skip top coat. This is one of the new shades that was in the last batch of colors released, and I think it's a great addition. Shell We Dance is a soft sheer blush. The color was so subtle that my camera just wasn't picking up the right hue, but you can faintly see the pink tint in my second photo. Even with the three coats above, the color still appeared sheer. I wouldn't recommend using more than three coats though, as the polish was already starting to thicken. Even though it's not totally opaque, this is a great color and perfect if you're trying to follow the blush trend for the season. Almost Almond is almost a fantastic polish, but stops just short of being awesome. it's a good neutral base, but something about the slight shimmer in the color makes it look slightly streaky in person. I think on some people this would look amazing — I'm thinking it'd be better on women with tanner skin — but for my skin tone it falls a little flat. For polishes like this, I wish I was able to splurge on a macro lens. Gilty Party is a truly gorgeous blend of microglitters in bronze, silver and gold. It's beautiful in person and has so much depth in the different metallic colors. Does it make a mess when you remove it? Absolutely. Is it worth it? 100 percent. Of these polishes, Gilty Party was the biggest stand-out for me, simply because I haven't quite seen another polish like this one in stores. Sally Hansen Complete Salon Manicure polishes retail for $7.99 each at chain drug stores and mass retailers nationally. You can visit the webpage for the line to view all of the colors before stopping by a store. Sally Hansen products in this post were provided for review. See my disclosure policy for additional information. I'm an unapologetic "Glee" fan, so every Thursday evening I catch the tail end of "American Idol" (I'm actually watching it right now). What I'm not, however, is a fan of Nicki Minaj (just a personal preference ... that voice), but when these OPI colors from the Nicki Minaj collection came out last year I fell in deep, deep love. To this day, Fly is one of my absolute favorite polishes because of how smooth it applies and how rich the color is. For this mani, I wanted to use all of the colors from the collection, but only succeeded in using four. From left to right (base color): Fly, Did It On 'Em, Metallic 4 Life and Pink Friday. Each of the colors shown is done with two coats for full opacity. Did It On 'Em and Pink Friday needed a thicker coat than Fly and Metallic 4 Life because they were a little streaky. I freehanded the chevron pattern on each nail (I'm too lazy to use tape most of the time). It's a little hard to see, but on my accent nail, I have a small crystal rhinestone. I'll end this now as "American Idol" finishes and I've muted Ms. Minaj mid-rant about a girl named Amber. Swatches to come this weekend! As I mentioned yesterday, I spent the weekend working with my husband on building a new display for my OPI polishes since I outgrew the rack I was using. I'm still storing all of my minis and miscellaneous OPI polishes (duplicates and older colors), but all of the new and frequently used stuff is now on my five-shelf display. I was going to use the bottom shelf for supplies, but ended up building a second display shelf for some of my frequently used miscellaneous polishes until I accumulate enough OPI polishes that I use on a regular basis. The rest of my stash is tucked away in my closet in my plastic Target drawers. If you're interested in building your own inexpensive nail polish display (mine was less than $20! 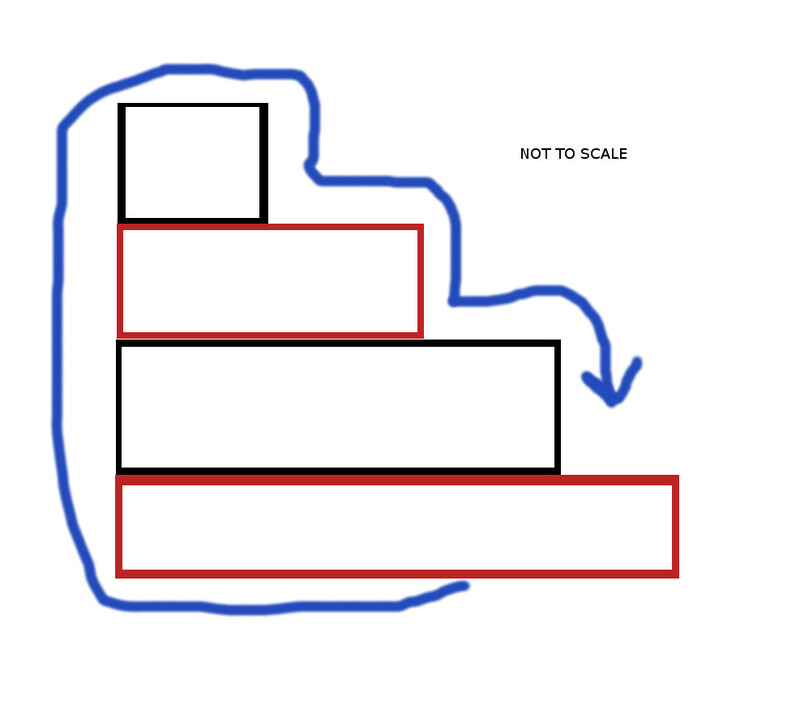 ), I put together a lengthy tutorial, featuring some diagrams that the hubby created and used while building mine. This post is kind of a long one, so read on after the photo for a tutorial! If you have any questions, email me at allison@glitterandglossnails.com or shoot me a message on Twitter @glitterglossluv—it's a long post with some crappy diagrams, so I'm happy to clarify wherever needed. A four- to five-shelf nail polish display shelf. Cost: Approximately $20 (varies depending on the type of fabric you buy). If you have a bookcase, then great—if not, you can also take this shelf display and use it on a desk, table, dresser or even on top of a bookcase. 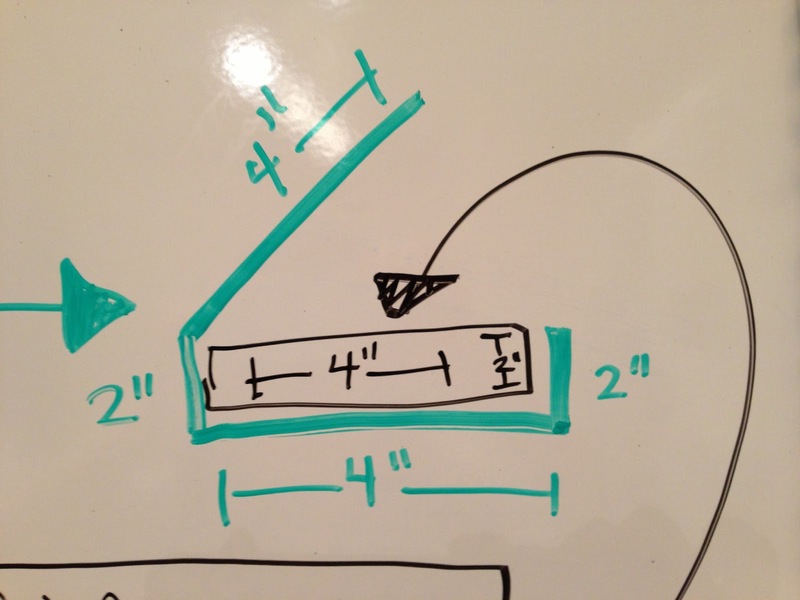 The rack will end up being 8 inches tall and 10 inches deep. 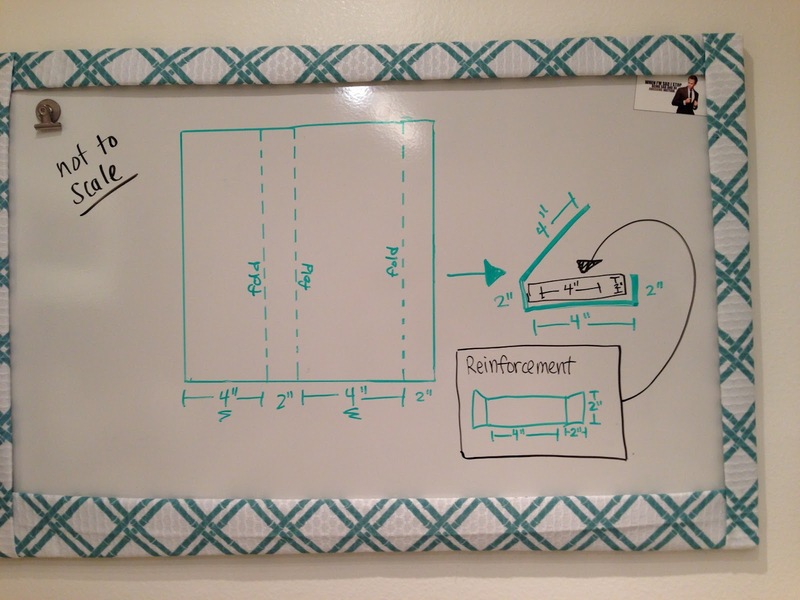 You can adjust the width depending on your own bookshelf or table. A thick roll of duct tape from Home Depot, 1.88 inches wide ($6.79)—any duct tape will work, but I recommend using one that's 1.88 inches wide so that it's almost as wide as each shelf. 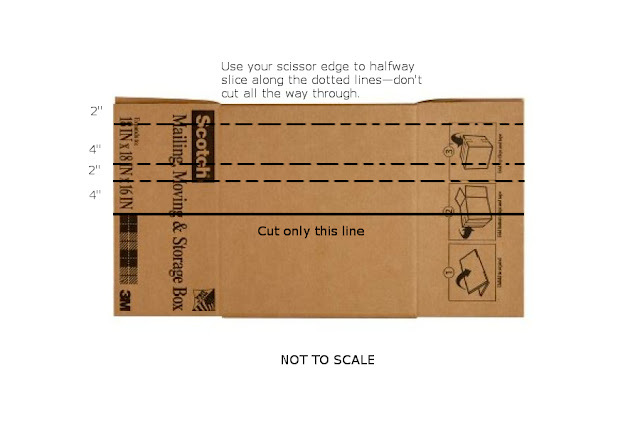 Using your scissors, cut the box apart along the pre-folded edges lengthwise on all four folds. You'll end up with four long pieces. Set three of the cardboard pieces aside—you're going to make the 2-inch block first. 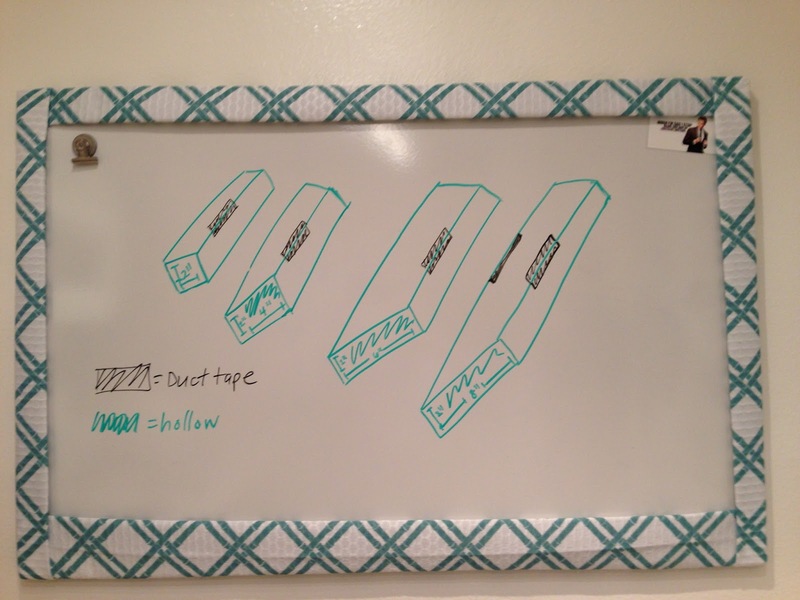 Use your ruler to draw three dotted lines two inches apart. The fourth line will be a solid line, also two inches away from the one next to it. On the dotted lines, you're going to use the scissor edge to slice halfway through the cardboard—don't cut all the way through though. The reason you're doing this is to create a crease so it's easier to fold. 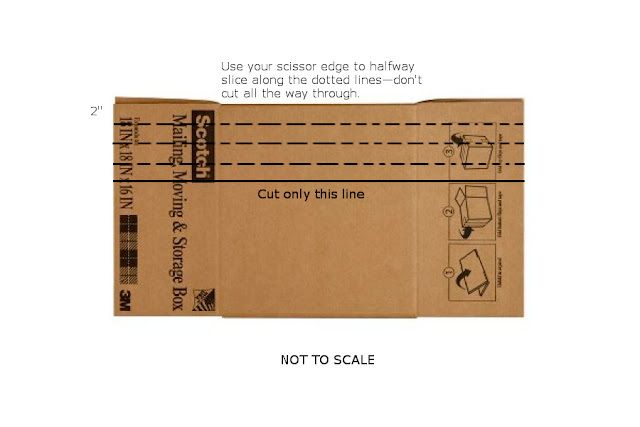 On the fourth line (the solid one), use your box cutter to slice all the way through. Be sure to save the extra piece, as you'll need it later. For the 8-inch box, you'll only be able to fit three sides of the box. 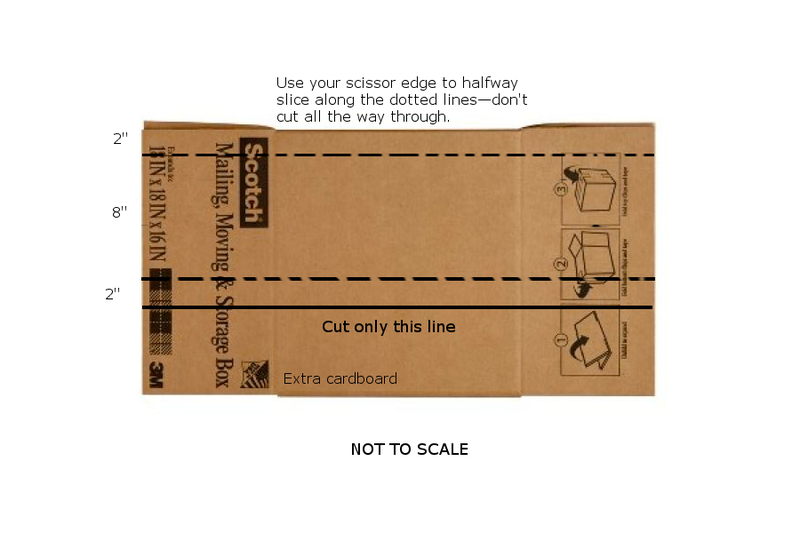 Measure out an 8-inch piece from the first piece of cardboard—cut that piece and set it aside. 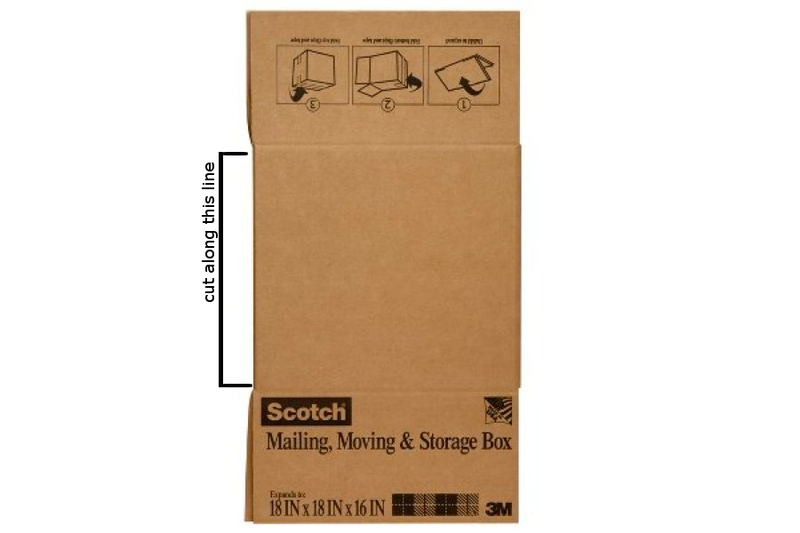 Next, you'll measure out the fourth cardboard piece according to the diagram below. 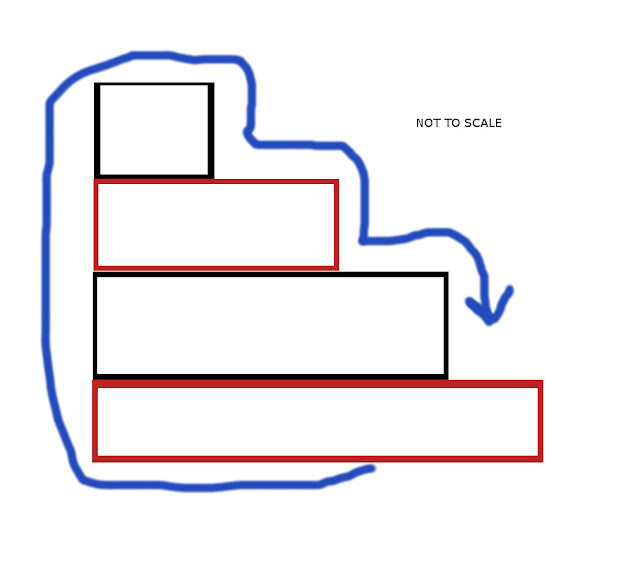 When you're done, you'll end up with four rectangles similar to the one below on the left in my hubby's diagram. Basically, you're going to fold the two sides in by two inches and use duct tape to secure those flaps to the 2" sides of the box. Spread the reinforcements evenly throughout each block, making sure you have two of them close to the open ends (but not flush to the end). Don't be afraid to use a lot of tape! This is where you get tape-crazy. 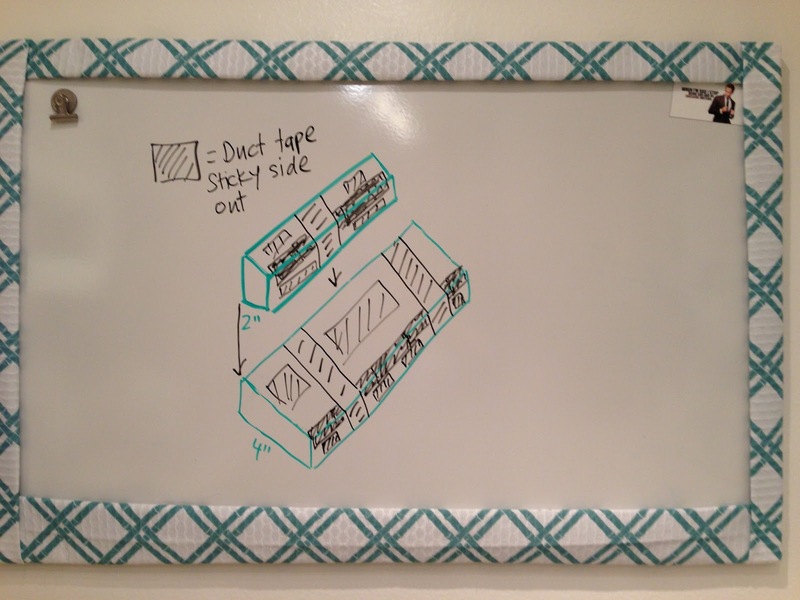 Wrap each block with plenty of duct tape with the sticky side out (you need to stick them together). I also added additional pieces of inside-out duct tape stuck on all sides of the blocks. Pictured is a diagram of two, but you'll need to do this for all four blocks. Once you're done, carefully attach the blocks together. The 8" block will be your base. Align the 6" block on top of it, making sure you have one flat edge when attaching them. 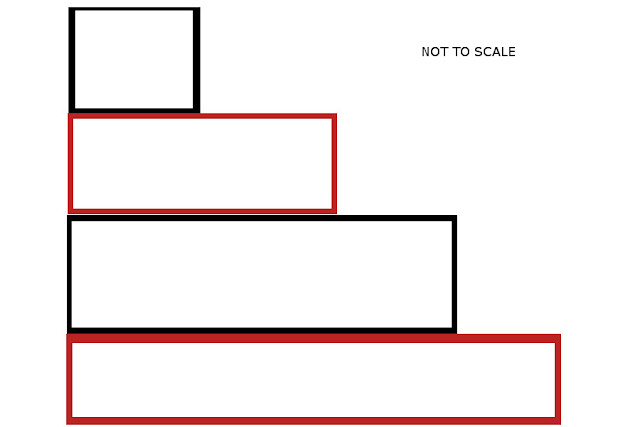 The 4" block goes on top of that, followed by the 2" block. After the three pieces are attached, grab an extra piece of cardboard and secure it to the flat side with more duct tape—this will help stabilize the blocks and make the whole thing sturdier. Lay your fabric out flat on a hard surface, with the patterned side face down. Tape the edge of the fabric to the bottom of the display (the 8" side) and begin to wrap the fabric around the back (the flat side). As you wrap it, make sure you're pulling it taut so that there aren't any creases or wrinkles as you press it onto the duct tape that you applied to the boxes in step four. Below is a rough sketch of what I did—the blue arrow is the fabric. Just make sure the patterned side of the fabric is facing out when you wrap! When you get back to the bottom of the display, use a few pieces of duct tape to secure it. Trim the excess from the sides, leaving at least two inches on each end so you can fold the ends in. Cut slits where necessary in the overhang so that you can fold it in; wrap the fabric inside the end of each block, using duct tape to secure. That's it! Whew ... that was a long one. If you're lucky, you got this done in about 2-3 hours without too much of a headache. If you don't plan to put this inside of a bookshelf, you can make the ends look prettier by stuffing the hollow parts of the tube with some colored tissue paper. If your bookshelf isn't very well-lit, you can also buy some battery-operated lights and stick them inside the shelves like I did—they were the As Seen On TV brand and I got three for $10. Today I'm swatching a few polishes from the Sally Hansen Insta-Dri Nail Color collection. These three are the newest colors in the line: Blue-Away, Fuchsia Flare and Peachy Breeze. The most important thing to know when using these polishes is that Sally Hansen means business when they say "Insta-Dri." The minute the lacquer comes out of the bottle, the drying process begins. This is a great thing for people who get impatient, but you definitely need to move quickly during application or you end up with a goopy mess. It's not an ideal polish for nail art, but the quick drying time means that you can use it as a base and begin your nail art even sooner. Blue-Away is a sky blue that leans toward the pastel side. It actually looks a bit lighter in the bottle than it does on the nail, but once applied it's a beautiful color. I wore this shade for less than 24 hours and got three different compliments on my nails. The formula is a bit streaky, but if you apply two coats and seal with a good top coat (I used Seche Vite), it has a really smooth and clean finish. Be sure that you wrap the tips—I missed the tip of my index finger and by the next day the polish had already started to chip off. The formula for Fuchsia Flare was a little difficult to work with—it seemed to dry a little quicker than the other two for some reason. When applying, be sure that you get the excess polish off the brush so you don't pool it over the nail (it's even more important than normal to do this due to the thickness of the polish). The colorful is a bright, cheerful pink and you might be able to get away with one coat, if you polish carefully. I used two coats above and sealed it with a good top coat, so it smoothed out whatever streaks there were. Peachy Breeze has a bit of a misleading name. I would consider this color more of a coral pink rather than peach, which I usually associate with more orange undertones. In the bottle, it looks like it's in the same color family as Fuchsia Flare, but on the nail it's actually softer and very feminine. Although the name doesn't quite fit, the color is great and very unique—I haven't seen a shade like this in a nail color in a while. The formula on this one was better than Fuchsia Flare, but definitely needs a top coat. As with all of these polishes, the brush has short bristles that lay flat for a thick stroke across the nail. Overall, my favorite color of the three is Blue-Away for its unique sky blue color—it also had the best application of the three. Sally Hansen polishes are $4.99 and can be purchased at drugstores and mass retailers nationally. I haven't seen "The Great and Powerful Oz" yet, but growing up "The Wizard of Oz" was my No. 1 favorite movie. C'mon ... it really has it all: flying monkeys, a wicked witch, talking inanimate objects, a man made of tin, beautiful pink dresses and ruby slippers. Judy Garland's "Somewhere Over the Rainbow" was one of my favorite songs, so these nails are inspired by her awesome performance. My favorite combinations are the pink/red pinky and blue/purple index finger ... but they're all so colorful and cheerful that they brighten my mood. I'm so in love with these colors that I don't even mind that my photos today turned out terrible. For this color-blocking manicure I started with a two coats of OPI Pamplona Purple (swatch below) and built from there. After my first color dried, I used striping tape to section off my nails to create a funky block pattern. The teal blue is OPI Fly, which has a great opacity—for some of the blocks where I had a lighter application I needed two coats, but one thick coat also worked great. The white—beautiful, crisp white—is OPI Alpine Snow, looking brighter and better than ever. Once the polish was mostly dry, I removed the striping tape and used my striping brush and black polish to draw the horizontal and vertical lines. So. In. Love. Here's a swatch of Pamplna Purple. It's such a gorgeous, rich hue and applies really smoothly. Also, in the background, you'll notice a Band-Aid on my thumb—another kitchen mishap. What do you think of the color combinations ... are you loving them as much as I am? One of my best friends moved up to the Bay Area for college and when I went to visit her, there were trees. Everywhere. So Connie, if you ever read my blog, this one's for you. I'm not an outdoors person by any means. I'm not even a "sit outside under a tree with a good book and enjoy the sun" kind of person. I enjoy working indoors, at a desk, with all the comforts that four solid walls and a ceiling provide me. This nail art is definitely inspired by my outdoorsy friends and husband, people that can spend all day outside and not want to immediately shower off all the dirt and germs that collect under your nails. My base color was three coats of OPI Funny Bunny—it actually applied a bit more sheer than usual, so I must have used lighter layers this time. The tree trunk was done with the same mix of Sinful Colors Black on Black and China Glaza Mahogany Magic that I used for my pizza nails yesterday, though today it came out darker because I upped the ratio of black to brown. I used a striping brush to apply the trunks and randomly placed branches (I think the middle finger turned out the best). With a dotting tool, I added leaves of Don't Mess With OPI. Once those were dry, I went over them with a smaller dotting tool using OPI Green-Wich Village to add some dimension—I think the two colors go really well together. Although I'm not a tree-hugger, I think this is easy nail art that anyone can accomplish.